Arsenal face an injury crisis ahead of the Carling Cup Final clash after Theo Walcott was ruled out with a sprained ankle in last night’s 1-0 victory against Stoke City whilst Cesc Fabregas emerged as a doubt after being forced off hamstring problem. Arsene Wenger hopes to discover on Thursday whether Farbregas will be able to play after limping off 14minutes into the game. 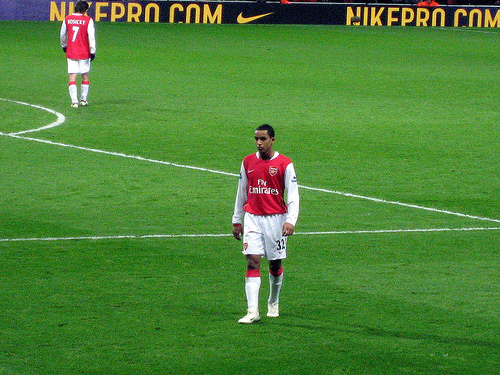 Theo Walcott joined his captain on the sidelines in teh second half after he twisted his ankle under Dean Whitehead’s challenge. The Gunners will take on Birmingham in Sunday’s final at Wembley, and represents teh club’s best chance to take home silverware since winning the FA Cup in 2005. Arsenal could also be without Robin Van Persie and Laurent Koscielny who both missed the game against Stoke and face fitness tests on Friday. Fabregas has admitted on his official Twitter page that he unsure whether he will recover from the hamstring knock and be ready in time, he said: “I don’t know if I’ll make Sunday or not, but all I know is that from this moment to Sunday I won’t sleep if it’s necessary.